There are quite a number of moving parts in your car’s engine. And looking under the hood can leave any layperson confused. For this reason, many people take their cars into a garage to for basic maintenance. There is nothing wrong with that, by any means, but there is at least one thing you can do on your own, and you won’t need to know where the fan belt is or how to check your oil. You can easily change your own air filter. Your air filter is really important. Any engine that runs on gasoline or diesel needs oxygen in order to run. But the air that gets sucked into your engine needs to be clean and free of debris to do its job well. This is where your air filter comes in. It’s important to remove invasive particles as they could clog up your system and reduce your engine’s performance. 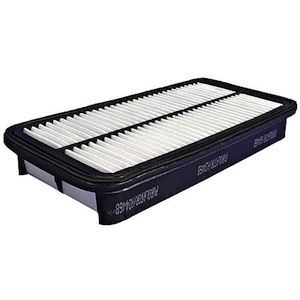 Replacing your air filter has been known to not only improve your car’s horsepower but also improves MPG. And replacing your air filter is as easy as popping the old one out and snapping a new one in. Now the question is: which kind of air filter should you buy? Many places that sell air filters will give you the option of buying a cheap paper one or a more expensive performance air filter. The price jump may be kind of shocking, but some would argue that it is more than worth it. Performance air filters are more expensive because they are made out of more expensive material. This performance material was designed to last, hence it does a much better job of grabbing dirt and smoke particles from the air and keeping your engine in tip-top shape. Another huge advantage of buying the more expensive kind of air filter is that they will last longer. Some filters can actually just get cleaned instead of being replaced all together, saving you money in the long run. Ask your mechanic what they think is the right direction for you to take, and make sure you follow any advice they or the internet may give you on changing your air filter to a T.
Posted in Maintenance, Shopping and tagged Air Filter, Automotive, DIY.